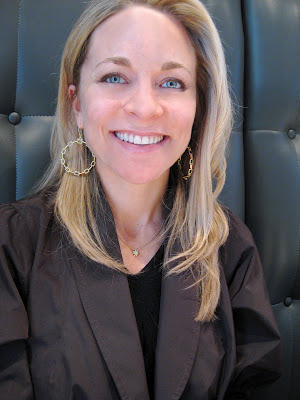 I met jewelry designer Elizabeth Showers today for lunch at one of her favorite hangouts, The Mint a tiny Asian fusion place with pretty blue tufted banquettes, perfect as a backdrop for a quick snap shot of her. She showed me her rings -- she's actually wearing three at once! They look like one big, wonderful ring, don't they? I love it. Elizabeth is always wearing something smashing. But with Elizabeth, things don't just stay on the surface. We talked about some of the causes she's involved with, including Two by Two for Aids and Art which she's co-chairing with her mother, Jan Showers on October 24. I don't think a mother-daughter duo has chaired the event before -- Jan and Elizabeth are both glamorous and interesting in their own right and I can't wait to see what they do together. Elizabeth, who is huge supporter of the National Eating Disorders Association, and the Dallas-based Elisa Project. designed the Hope Star Collection "...to discourage self doubt and inspire all women to feel beautiful." She makes a donation to these charities each time you buy a piece of jewelry from the collection. Elizabeth struggled with an eating disorder when she was younger, and so volunteers her time helping to counsel young women with anorexia. "Eating disorders are one of the toughest addictions to overcome," she said, "because you have to eat to live and you're facing your addiction each time you put something in your mouth." Elizabeth is also turning her good fortune into a way to raise money for charity. A gold and diamond pendant she designed was selected by Sports Illustrated to grace model Tori Praver's neck in its current Swimsuit Issue. 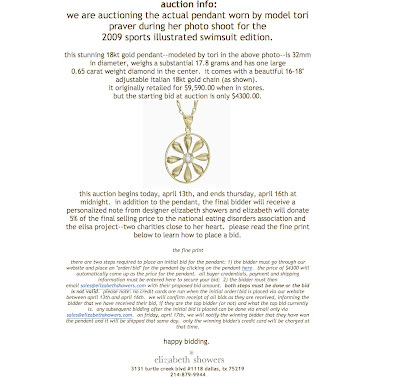 So she's auctioning the necklace off, and giving five percent of the selling price to her two favorite charities.